Numerous highly effective pharmacological agents are available to treat acute exacerbations of chronic bronchitis (acute exacerbations of chronic bronchitis). TABLE: Pharmacological Management of Underlying Disease During an Acute Exacerbation of Chronic Bronchitis summarizes the general pharmacological agents and classes used to manage acute exacerbations of chronic bronchitis. The primary therapies used in acute exacerbations of chronic bronchitis treat the causative infection (antibiotics), relieve symptoms (bronchodilators), and treat the underlying inflammation (corticosteroids). TABLE: Current Therapies Used for Acute Exacerbations of Chronic Bronchitis summarizes the leading antibiotic therapies used to treat the infection. 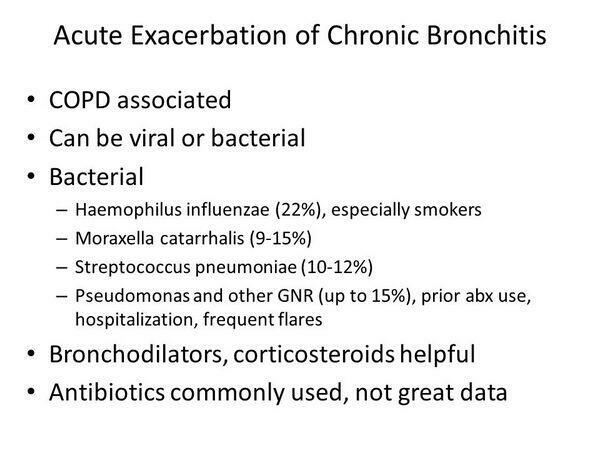 Most acute exacerbations of chronic bronchitis cases require empiric antibiotic therapy because of the difficulty in definitively distinguishing exacerbations of bacterial etiology from those of nonbacterial origin. Empiric therapy is based on likely infecting pathogens, local resistance patterns, severity of the exacerbation, and patient history. Bronchodilators (e.g., inhaled beta2 agonists, inhaled anticholinergics, theophylline3) Administer as soon as possible during an exacerbation. Increase usual dosage. Consider nebulizer for delivery. Corticosteroids Oral, inhaled, or intravenous administration. Short courses may provide benefit. Usually given only in hospitalized patients. Mucolytics/antitussives May help facilitate clearance of airways. Oxygen therapy Administer if PaO2 is less than 55 mg Hg. NPPV or mechanical ventilation Beneficial support strategy for hospitalized patients. aPotentially toxic; not as effective as inhaled bronchodilators; monitoring is important especially when coadministered with antibiotics. Hg = Mercury. NPPV = Noninvasive positive-pressure ventilation. PaC>2 = Partial pressure of arterial oxygen. Note: When patients come in for treatment of acute exacerbation of chronic bronchitis (acute exacerbations of chronic bronchitis ), most if not all of the patients will already be on short-acting and long-acting bronchodilators, anticholinergics, and inhaled corticosteroid-containing products to treat their underlying lung condition, which can vary in severity. bid = Twice daily; q4h = Every 4 hours; q6h = Every 6 hours; q8h = Every 8 hours; q12h = Every 12 hours; qd = Once daily. IV = Intravenous formulation. PO = Oral formulation. This section focuses on the antibiotic therapies used to treat acute exacerbations of chronic bronchitis. In addition to the available agents to treat the underlying lung condition and infectious episodes of bronchitis, vaccination against the causative pathogens of acute exacerbations of chronic bronchitis has been debated. However, the value of pneumococcal vaccination in patients with chronic bronchitis is not well established; it is not clear whether vaccination prevents acute exacerbations of chronic bronchitis in these patients. However, pneumococcal vaccination is safe and can reduce invasive pneumococcal infection, and current recommendations favor vaccinations in all patients with high risk of developing exacerbations (i.e., patients with prior history of underlying chronic pulmonary obstruction). Pathogen resistance to an antibiotic reduces the efficacy of the agent and can endanger the life of the patient. Resistance is more likely to occur if a patient has been recently treated with an antibiotic (as can be the case in chronic obstructive pulmonary disease [acute exacerbations of chronic obstructive pulmonary disease ] patients suffering frequent exacerbations). aFor skin infections. R = Registered; S = Suspended; PC = Preclinical. From a public health perspective, antibacterial resistance can occur after the antibacterials have been used (or overprescribed) in the community for a period of time. Therefore, the efficacy of a given antibacterial and the susceptibility of pathogens in the community may change over time as usage patterns change. Indeed, the prevalence of resistance exhibits geographic variation, which researchers believe is due to the variable volume of prescribing. In recent years, antibiotic resistance has become an increasingly important factor influencing prescribing choice. During the last 10-15 years, a steady rise in the frequency of antibacterial-resistant pathogens, such as β-lactamase-producing H. influenzae and Moraxella catarrhalis (pathogens predominantly observed in acute exacerbations of chronic bronchitis episodes), strains of penicillin-resistant Streptococcus pneumoniae, and erythromycin-resistant S. pneumoniae, has been observed. This rise has limited the utility of older antibacterials, such as penicillin and early-generation cephalosporins, and spurred the need for new agents. Fortunately, the pharmaceutical industry has developed newer agents over time, with expanded activity against resistant pathogens. However, bacterial drug resistance is an inherent factor in this market and will continue to be the primary driver for innovative new antibacterial drugs.